Borla Performance loves to race cars. Much of its 30-year legacy is intertwined with serious racing vehicles and the exhaust systems and headers that propel them. From LeMans to Baja, BORLA has never run from a fight -- the cauldron of competition is in the BORLA DNA. 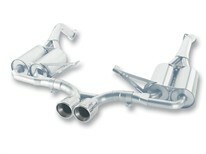 That passion has spearheaded the new Cayman S exhaust systems. Developed to support our race teams that demand a quality system that performs at high levels with extreme endurance. The Race System (PN12653), features 4” fully polished tips; the Enduro system (PN12654) features 3-½” polished tips. Both systems are intended for racing and are not legal for highway use. Both systems are BORLA logo embossed and make outstanding power. And when BORLA says that, you know you can take it to the bank. The test team that drove the Cayman S project cars during development all exited with big smiles and a happy foot. Enhanced Power, the Right Sound on a Great Car can’t be beat. It takes enthusiasts to build quality components and BORLA people, from the owners down, are Porsche owners and true enthusiasts. BORLA, the original pioneers of high quality, austenitic stainless steel (superior to 409 or aluminized steel) free-flow exhaust utilizes patented award and race winning technology to deliver quality, sound, performance gains and enhanced fuel economy -- all with an easy bolt-on installation. And backed by an unsurpassed written million-mile warranty.